What do you get when you put a hungry monster in a room full of trash? A feast! The furry OmNomster will eat anything in sight, from banana skins, to fishbones to broken umbrellas. 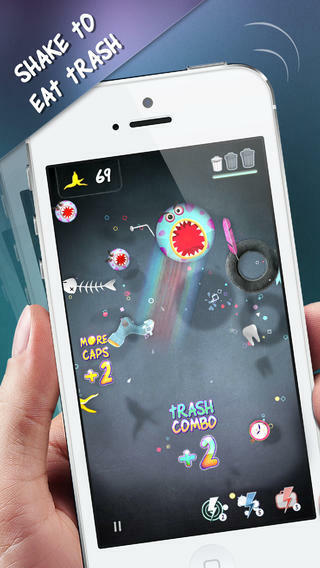 This App of the Week will entertain you with a silly character, easy shake-and-play mechanics and chirpy music. To consume all the floating treats, you just shake your device to bounce OmNomster off the walls. Though it’s not too tricky, watch out for the gumball machines – upon eating these, OmNomster becomes a little sluggish and starts to stick to the walls, potentially missing pieces of “food.” Once you miss three pieces of trash, it’s game over. The fun part is working with powerups – you can customize the look and feel of your OmNomster to include a mustache, spectacles and more. OmNomster is the work of the talented Olaf Morelewski, an indie developer based in Warsaw, Poland. An architect by trade, Olaf took an interest in mobile gaming six months ago and quit his day job to start a boutique studio. The game concept of OmNomster evolved over time. At first Olaf thought to create a game where players shake a monster as fast as possible to destroy him by bouncing him off the walls. However, after sketching out the monster, he found the character too cute to destroy and thought audiences would prefer to feed him goodies instead. Olaf tells us that Corona’s Physics Library, which drives all the centric-gravity gameplay, was essential to his development. He also relied on graphics.imageSheet to manage all the spritesheets of the monster’s animation and turned to Particle Candy for the special effects in the game. Olaf also implemented the gameNetwork library for Game Center and Google Play Game Services, and utilized the store library for in-app purchases. What’s one piece of advice Olaf would give fellow developers? Make a “to do” list and stay organized throughout the process. Olaf used the ActionMethod by Behance to manage his workflow which helped him stay motivated by checking off completed task each day. 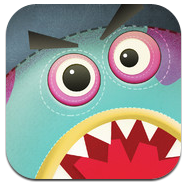 If you’re hungry for a fun new gaming experience, download OmNomster from iTunes or Google Play. It looks fantastic. Great work Olaf! Very clever implementation – nice work. I really like your graphics too! Did you do everything in-house (graphics, music) or did you also work with consultants?